Protect your skin from ultraviolet rays with a light, oil-free formula that absorbs and dries quickly -- without leaving behind any greasy residue. This light, water resistant sunscreen will keep your skin protected for hours with SPF 30, features UVA and UVB protection, is PABA-free, and contains aloe vera to soothe and smooth your skin. It is serious sun protection for all day - everyday use. 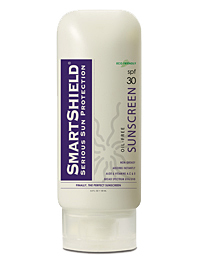 SmartShields oil-free, "dry" formula means the sunscreen is absorbed instantly. It does not wear on top of skin; it actually bonds to the skin. Our sunscreen formula has no noticeable "sunscreen feel", even after multiple applications.